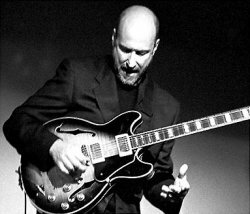 John "Sco" Scofield is an American jazz guitar player, a masterful jazz improviser influenced by blues, funk, rock and R & B. There's so much to learn from his playing both his technique and his theory. He is a master of scales connections, arpeggios, outside playing and easily blend lines from blues, jazz, funk and bebop music. He used to play with his Ibanez AS-200 plugged into one or two vox AC-30 sometimes with many effects like an Ibanez chorus, a digitech whammy/wah, a boomerang phrase sampler, a micro synth, distorions, filters and many others. We can see him playing a Fender stratocaster and an Ibanez T-style guitar in some videos and hear them in the electro-jazz album "Uberjam deux". He also uses a Martin acoustic guitar, a Guild Jumbo, a Takamine and a Montavo flamenco guitar. Subscribe to the newsletter to stay informed about latest transcriptions. This jazz guitar lesson is about John Scofield solo transcriptions (8 bars) with tabs, video and analysis of the bebop tune "Wee" from the album en route. This is a jazz guitar solo transcription of John Scofield from over big top. John Scofield jazz fusion guitar lesson with tabs using altered and pentatonic scales, Phrygian and Dorian modes.